It’s no secret that dogs love treats. 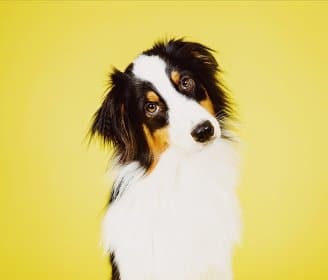 But if you buy your treats at the local pet food store, you often don’t know what’s in them — what exactly is “meat phosphoric acid”? — or how many calories it is, or if it’s safe for Fluffy or Fido to eat. There’s a simple solution: bake your own treats. If you’ve never ventured into the canine culinary world, don’t worry. Cooking for dogs is much less stressful than, say, putting together a four-course meal for an important client (or your mother-in-law). Dogs will love your treats, even if they look like, well, dog food. 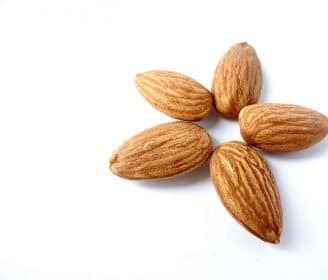 Just make sure to check your ingredients to avoid anything harmful to your dog (including artificial sweeteners like xylitol, raisins, chocolate, avocado, macadamia nuts and others that can be found here. Start simple. There are tons of recipes for yummy treats that have five ingredients or less, and the only skill you need is the ability to pre-heat your oven. Don’t worry if you burn the first batch (and the second or the third), your dog will still love them. 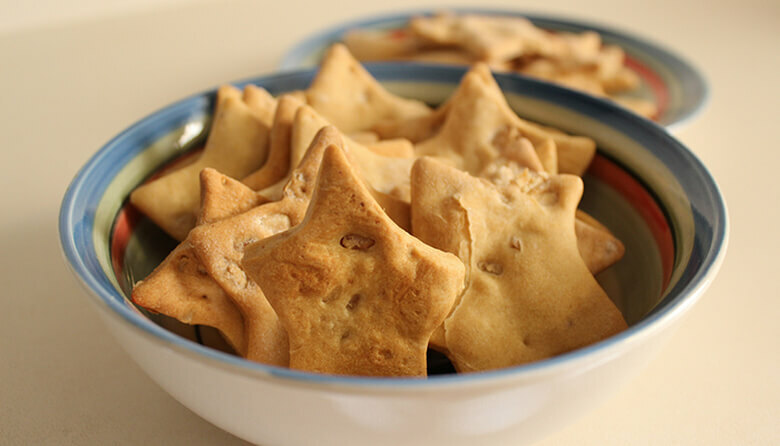 Check out 30 dog treat recipes with five ingredients or less. If your dog loves peanut butter, you can’t go wrong with this simple recipe. All you need is flour, peanut butter, eggs and water. Mix it all together, add enough water to make dough, and roll it out. You can use cookie cutter shapes for a little professional pizazz. Bake for 20 minutes. These taste as good as they smell! This is a great starter recipe, and your dog will think you’re a master baker. All you need is organic whole wheat flour and your choice (or your dog’s) of pureed baby food. Mix together into a stiff dough, roll out and use a cookie cutter for a professional touch or a pizza cutter for cubes. Bake on a cookie sheet lined with parchment paper (get the parchment paper at most grocery stores). You come home after a long day, and all you want to do is veg in front of the TV with your friendly canine couch potato. He sits down to wait for his nightly treat, but you discover your cookie jar is empty. You’re way too tired to bake, so what do you do? Use this super simple two-ingredient recipe. Get some yogurt from the fridge, mix it together with peanut butter, dump into cupcake papers (you can use small paper or plastic cups if you don’t have those on hand), and freeze. Nothing could be easier. These are soft and chewy, perfect for little puppy teeth. You’ll need eggs, almond butter, bananas and cinnamon. Mash the banana, add the other ingredients, mix together using a fork, and spoon out small dollops onto a baking sheet. Bake, cool and release the puppy hounds. You won’t be able to resist sharing these with your pooch. They’re made with sweet potato, coconut oil, turmeric and cinnamon (both spices are safe and healthy for dogs). Wash and peel the potato, cut into strips, coat with oil and spices, spread out on a baking sheet and bake. 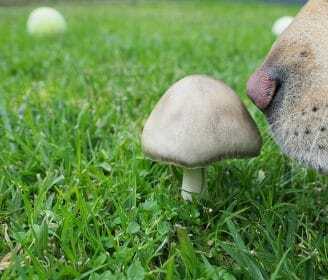 Be sure to let these cool before letting your dog at them. Wild rice is recommended, but any high-grade rice (just don’t ever use “feed rice”) will do. Add diced or shredded chicken, a little rice flour (you can get Bob’s Red Mill at many grocery stores), a little diced parsley and an egg. Pack the mixture into a mini muffin pan or silicon molds and bake. Easy to make and your dog will go crazy for these. Combine whole wheat flour, wheat germ, melted bacon fat (you get to eat the bacon! ), 1 egg and water. Mix together into a dough, roll out and cut into small bars, poke little divots into them with a chopstick or something similar, place on a cookie sheet, and bake. Not only do they taste good, but they look beautiful, too. Whole wheat flour, oil, chicken stock — that’s it! Mix together into dough, roll out, cut into any shape and bake. These have a longer shelf life if you turn off the oven when they’re done and leave the biscuits in there until the oven cools. For softer biscuits, take them out of the oven to cool. 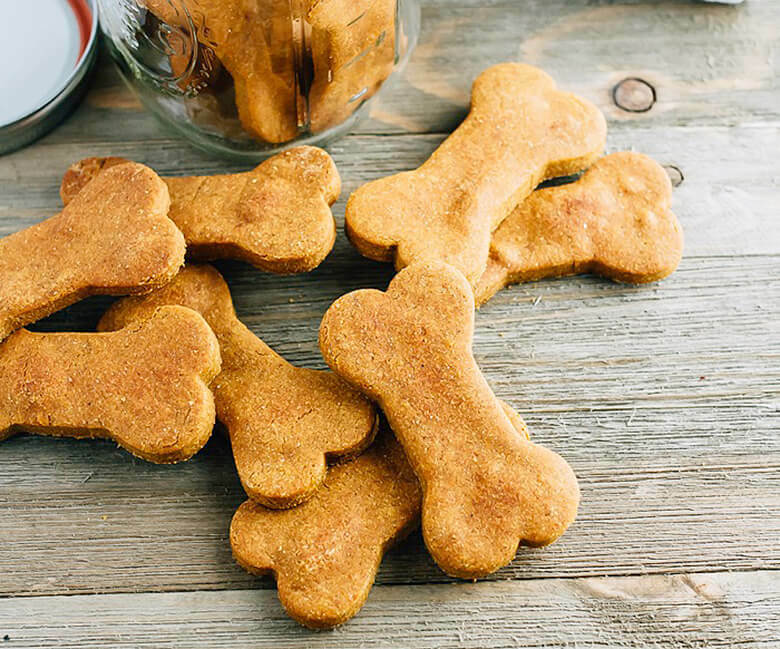 Bone broth is all the rage – and now your pup can also reap the health benefits with This Dog’s Life bone broth treats. Choose between beets, parsley or turmeric (or make them all!) and mix with water to puree. Combine your flavor with gelatin, before adding to hot bone broth. Put in gummy molds, freeze and enjoy! If you use bone-shaped cookie cutters, these look much harder than they really are. All you need is uncooked oatmeal (the real stuff, not instant), a banana and peanut butter. Use a food processor or blender to grind the oats into a powder, mash the banana and peanut butter together and pour in the oats. Keep a tablespoon of oatmeal to dust the surface and roll out the mixture. 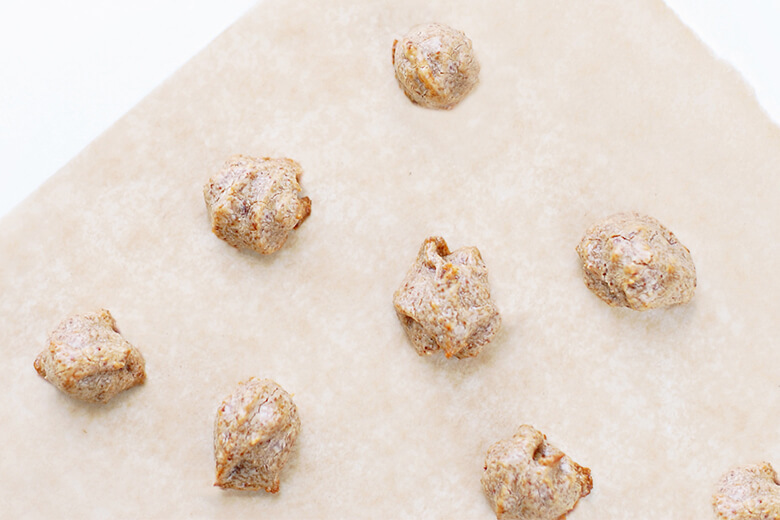 Cut into shapes, place on a parchment paper lined cookie sheet, and bake. These are great for the holidays. 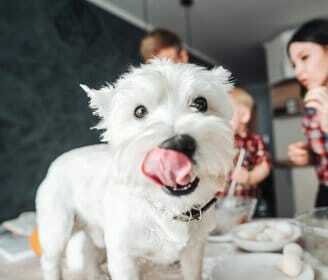 (Why shouldn’t dogs enjoy a little Thanksgiving goody?). Get canned pumpkin (not pumpkin pie filler), an egg, shredded carrot and whole wheat flour. Mix together into a batter, roll into small balls, place on baking sheet and bake. You’ll get around four dozen. Store in refrigerator for longer shelf life. Pumpkin puree, peanut butter, eggs and whole wheat flour: that’s it. You’ll need an electric mixer with a paddle attachment (or a food processor). First blend pumpkin puree, peanut butter, and eggs. Then gradually add flour until dough is no longer sticky. Knead the dough a little to smooth, roll out, cut into cute shapes, and bake. Your dog will swoon. All you need are some bananas, beets, blueberries, Greek yogurt and a carrot stick, and you got some yummy pup pops from This Dog’s Life. Blend the bananas and yogurt, removing most of the mixture into cup. Then add the blueberries to the remaining banana/yogurt puree and blend. Scoop out. Finally return a little of the plain banana mixture to the blender and add beets. Layer the three separate mixtures into popsicle molds, put a carrot stick in and freeze. This one has only three ingredients: watermelon (take out the seeds or get seedless), coconut milk or coconut water and honey. Put them in a blender and puree. 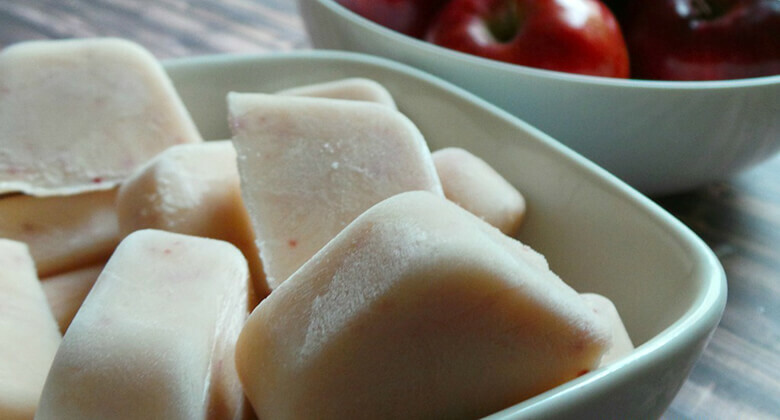 Pour into ice cube tray (try this fruit-shaped one) and freeze. The best thing about these? You can eat them too. All you need are five ingredients and a freezer. Get some canned pumpkin, fresh blueberries, bacon, water and rawhide chew sticks. (If you aren’t a fan of rawhides, you can use carrot sticks.) Blend together pumpkin, crumbled bacon and water until smooth, though leave or add some crumbled bacon bits. Get a popsicle mold, put three or four blueberries on the bottom, and pour the mixture on top. Use the rawhide chews for the popsicle sticks. Let freeze for a few hours. Serve with a tropical drink with an umbrella (only kidding). This only takes 5 minutes to make. Put pumpkin puree, chunky peanut butter and eggs into a bowl and beat. Add whole wheat flour and mix into dough. Roll out, cut out with cookie cutters and place on a parchment lined baking sheet. Bake, cool and let your dog enjoy. Just make sure your dog doesn’t react to grains as there’s a lot of whole wheat in this recipe. This may sound a little strange to humans, but dogs love them. Get a can of salmon, a (baked) sweet potato, eggs, coconut flour (you can get it here) and some coconut oil for greasing a pan. Stir together coconut flour, eggs, and salmon. Let sit for 10 minutes, then stir in the skinned sweet potato. Put into a pie or cake pan and bake. After it cools, cut into brownie squares. Organic flour (unbleached), rolled or steel cut oats, peanut butter and hot water is all you need for this recipe. Mix flour, oats, peanut butter and hot water — in that order. Knead the dough, roll out, cut into shapes and bake on a lightly greased cookie sheet. Allow to cool completely. Keeps for a week in an airtight container, up to three weeks in the fridge, and up to six months if frozen. Bake a sweet potato and scoop it out into a bowl. Mash it together with a banana. Add whole wheat flour, eggs, and whole oats. Knead the dough and shape into small squares, or use a cookie cutter. Bake on a parchment lined baking pan, and then leave in the oven to dry out. These look as good as they taste. Related: Can Dogs Eat Bananas? Note: These are not real bones (but your dog will love them). There’s only four ingredients: flour, cheddar cheese, oil and water, but you can add an egg for extra nutrition. Mix together the flour and cheese. Stir in the oil and water. Mix together until you have a stiff dough, and then roll out. Using a bone-shaped cookie cutter, cut into shapes. Load onto an ungreased cookie sheet and bake. It may not be a combo you would enjoy, but your dog will gobble these up. Combine whole wheat flour, pumpkin puree and cinnamon in a large mixing bowl. Add either chicken, beef or vegetable stock, and mix together into a thick dough. Roll out until ¼ inch thick, and use a cookie cutter of your choice. Place shapes onto an ungreased cookie sheet and bake until golden brown. They make great gifts stored in a Mason jar for the dog in your dog’s life. Choose either whole wheat, brown rice, or gluten-free flour. 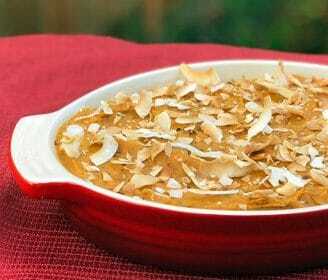 Mix in grated carrots, an egg and unsweetened apple sauce. Blend together until dough forms, roll into small balls about ¼ inch thick, and bake on a cookie sheet lined with parchment paper. Bake until golden brown and let cool on a wire rack. You can mix up the design by using a variety of different cookie cutters. Even the baking-challenged can make these. All you have to do is slowly blend an egg, 2/3 cup canned pumpkin, and a little cinnamon into 1 ½ cup whole wheat flour and work together until you have dough. Roll it out, cut it out, and place on either a parchment paper lined sheet pan or a non-stick cookie pan. Bake until they’re crisp, and then let them cool. That’s it! We all know chocolate is a big no, no for dogs, which is why carob has been a godsend. 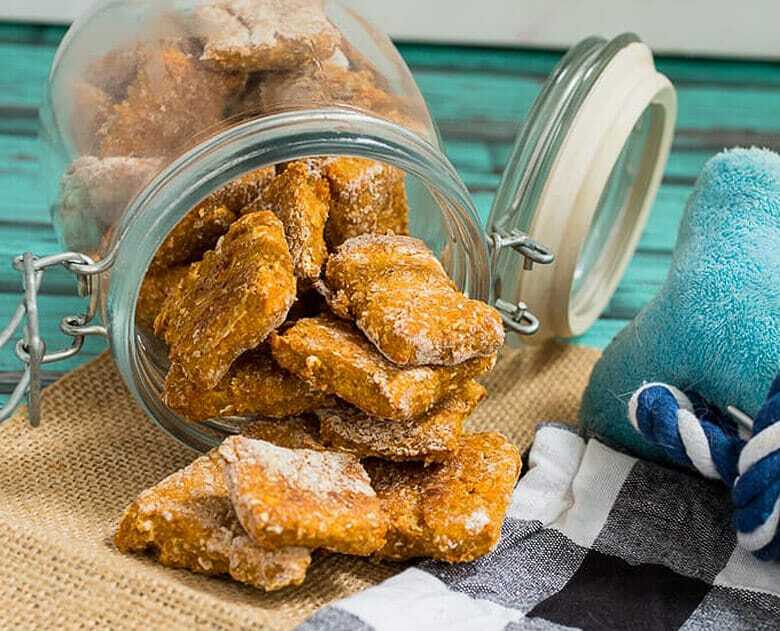 These carob crunchers not only provide a little sweetness for our pups but are also gluten- and wheat-free. Combine rice flour, carob powder, cinnamon, vanilla extract and water into a bowl. Create a dough ball and then roll out on floured surface. 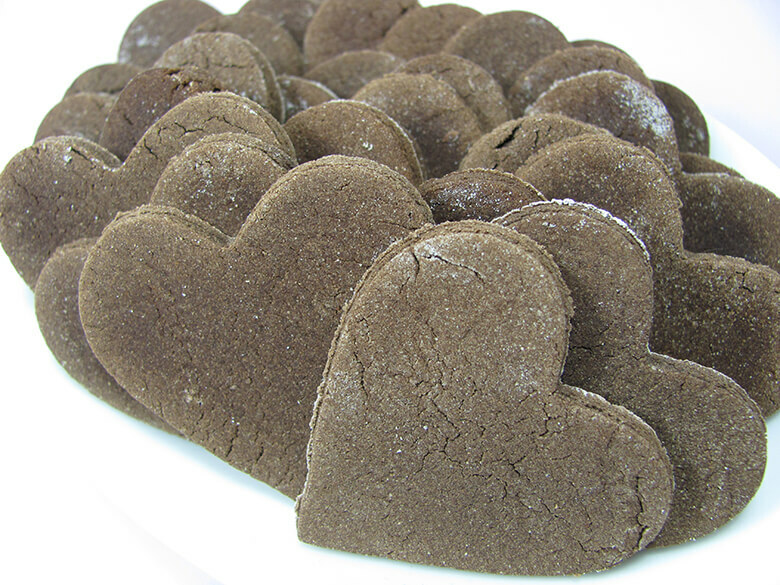 Cut with a cookie cutter (these hearts are super cute), bake and then refrigerate. All dogs love bacon and cheese. For these quick and easy treats, fry up some bacon until crispy (or pick some up from your local greasy spoon). Let it cool on a paper towel. Put the bacon into a mixer, blender, or food processor, add shredded cheddar cheese and milled oatmeal. When the ingredients are blended, add a couple of eggs, and work into a dough. Roll it out, cut into shapes, and pop in the oven. Your dog will love you forever. These are healthy, yummy and easy to make with only 5 ingredients: coconut flour, peanut butter (or any other nut butter), eggs, coconut oil and sweet potato (or pumpkin) puree. Mix them all together in bowl and form the dough into a ball. Roll out on parchment paper, cut into shapes and transfer to a parchment lined cookie sheet. Bake only for 12 to 15 minutes until hard. If you want to be fancy, you can add in shredded carrots and parsley. This recipe is open to improvisation, depending on what you have on hand. It’s really simple. Just put some seeded, peeled chunks of watermelon in a bowl, add raspberries (or blueberries, strawberries, melons, pears or pineapples) and blend with a fork into a pink mixture with a few chunks of fruit left for texture. If you want it smoother, pop in a blender. Pour into heart molds, cover the tray with plastic wrap, and freeze. This is good for dogs with grain allergies. You need only three ingredients: oat or rice flour, mashed banana and peanut butter. Mash the banana into the peanut butter. Add the flour, and mix into dough. Chill the dough for 20 minutes, then roll out on parchment paper and cut out shapes. Transfer to a parchment-lined cookie sheet, and poke holes in the center so steam can escape. Bake, cool and let the treating begin. This is so easy, a toddler can make it. Take two apples and slice into small pieces after removing the seeds and core. Mix the slices into one cup of non-fat Greek plain yogurt. Put into a blender with a little water and blend into a liquid. Pour into an ice cube tray (trays with shapes makes them pretty) and freeze until hard. 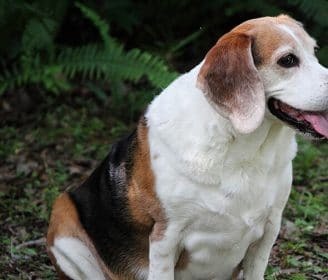 If your dog has diabetes, it’s hard to find them treats they can enjoy safely. The solution? Make them yourself. This recipe has only three ingredients: whole wheat flour, beef liver and eggs. Put the liver in a food processor and pulse until finely chopped. Add flour and eggs and blend until smooth. Line a jellyroll pan with parchment paper, and spread the mixture evenly in the pan. Bake for 15 minutes (or until center is firm with the consistency of sponge cake), and then cut into squares (a pizza cutter works best). Dogs without diabetes will love these, too.